A Really romantic Civil wedding in Rome can take place in the complex Vignola Mattei, located close to the ruins of the Baths of Caracalla. The ceremony is celebrated in an ex-convent, in a rustic and less formal atmosphere surrounded by a beautiful park. Civil Wedding ceremonies in Caracalla are celebrated inside a charming and intimate hall of the Complex. 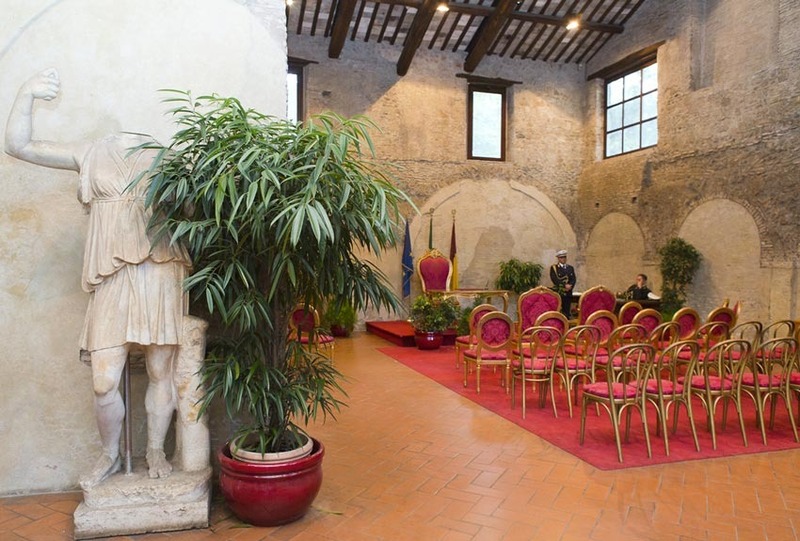 This venue is certainly less formal than the Campidoglio marriage hall and ideal for couples desiring a relaxed and private ceremony. Sundays: from 9:00am to 12:30. Wedding ceremonies can be booked 6 months in advance along with a sworn declaration that must be scheduled one or two days before the wedding. This is a very popular destination for destination weddings in Rome, each year many couples from all over the world get married in our capital, so you may expect that civil ceremonies are celebrated one after the other and the rite itself is kept quite brief. Your Civil wedding ceremony at Caracalla can be customized with personal readings, vows, music and floral decorations.